When you need a new home heating and cooling system, it is worth taking a look at some of the great geothermal systems on the market today. Millie’s Heating & Air Conditioning provides comprehensive Great Falls geothermal installation services to customers all over the area, and we would be glad to discuss the benefits of this great technology with you. While many heating and air conditioning companies can install geothermal heating and cooling systems, you want yours put in by someone who has worked extensively with this type of system. Our technicians are well versed in all types of geothermal installations, so you can be sure we will get the job done right the first time. Many people think that geothermal systems are too expensive or not practical for their homes. But the truth is that this technology has become much more accessible and adaptable in recent years. As long as you have enough room around your home for the underground component of the geothermal system, it is worth considering adding one to your home. It is true that the cost of installing a geothermal system is greater than the cost for some other systems, but that will be more than made up for by the long life of the system and its very high energy efficiency. When you consider this whole picture, it makes sense to choose a geothermal installation for your Great Falls home. Since most of the chronic problems a geothermal home heating and cooling system can develop are the result of improper installation, it is very important you have an experienced professional put yours in. Millie’s technicians have worked extensively with geothermal technology, and we make sure they have access to all of the best tools and equipment available. We also only use the highest quality parts and materials on all of our projects, so you can be sure the work we do will hold up over the long term. A geothermal installation in Great Falls is a substantial undertaking, which is why we make sure to go over the entire process with you before work begins. That way, you will know exactly what we are doing and when, and we can complete your installation with as little disruption to your daily routine as possible. 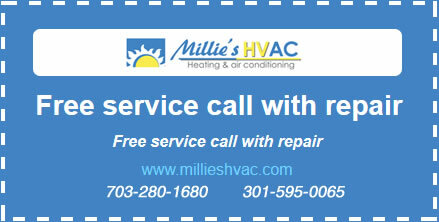 So call Millie’s today to learn more about how a geothermal system can keep your home comfortable all year long.